Calzaghe v Jones Jr. anyone going to watch it? Think it is Calzaghe's toughest test yet, not sure if he will win, I am still undecided. Anyone know what time it is due to start? i'll miss it. the hotel i'm staying at wont have it so its sky+ and watch it when i get back. Hoping Calzaghe wins, to go undefeated through a career as long as Calzaghe has been around is remarkable. Calzaghe to take it on points. Think its a 4am start. Yep calzaghe on points looks good, he is a class act. JC will knock him out I reckon, RJJ isn't as good as he was. I'll go for Calzaghe to win in the 8th Round with a stopage. Think the fight is scheduled for a 3am start. Calzaghe rarely knocks folk out. 6 out of his last 8 have been on points, and that's when he has been fighting opposition of the same class as Jones, not when he was starting against much poorer fighters, he is not a powerful puncher compared to some. He's had 45 fights, won 45 of which 32 wins were by knockout. True but against quality opposition he hardly ever knocks them out. Agreed, the fact that he's not at his peak and his most recent opponents are a lot toughter suggests why his knockout percentage has dropped in recent years. This one has a points victory written all over it. Looked like it was gonna be a bit of a battle for Joe after the knockdown in the 1st, but after he composed himself, the showboating begun, and he absolutley destroyed him. Looking forward to the re-match in Cardiff. 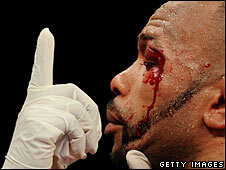 But like Calzaghe said, he [RJJ] might not want anymore of that! RJJ should retire, he's finished. Can't see there being a rematch. Jones took an absolute pasting last night. Absolute quality performance by Joe again, a treat to watch. He should now retire undefeated. To stay undefeated for the length of time he has is amazing and don't want him to finish on a bad note. I'd say it was more to do with his weak hands, not his punching power. I've never seen the point of boxing (and yes, I've read "The Power of One" and "Tandia") but congratulations to our current Sports Personality of the Year for a clean record. Seems like a decent bloke too. 46 fights is a lot, and even though he dont do much sparring, and hardly got hit, the cumulative effect of 20 years of boxing must take its toll. Hes got nothing else to prove, cleaned up the division. something tells me he is going to go on until he gets beat tho. another fight on setanta this weekend. Should be a good one, never seen the guy barret before but I have seen Haye and he is good, not sure who ill win as it's Haye's first fight since moving up to heavy Weight. Haye will absolutely blow him away. Agree, Haye will blow him away with his pace and power, with Haye being used to being in a lighter weight his hand spead will be much quiker than Barrat. Haye should win no bother, but he is a bit chinny aswell. Edited by exile aberdeen, 12 November 2008 - 04:42 PM.